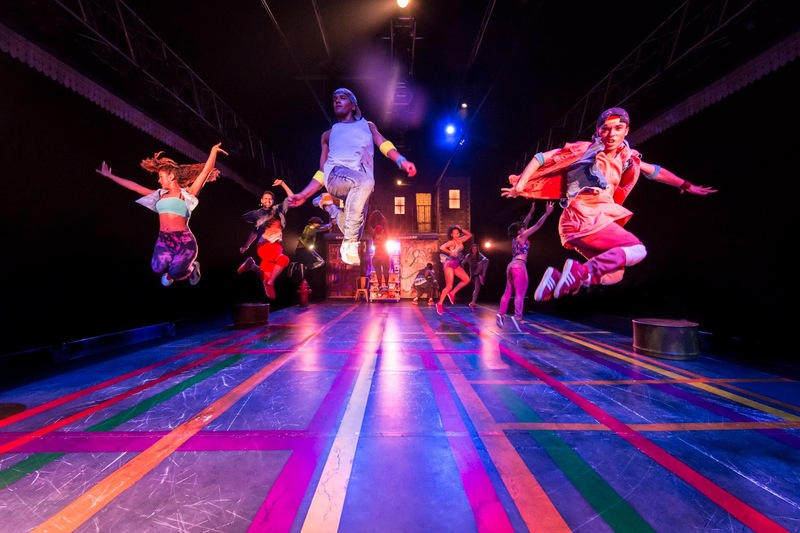 October is officially upon us, but while the weather gets colder and London begins to look more and more bleak and autumnal, the King's Cross Theatre is still sizzling with summer heat thanks to In The Heights! Lin-Manuel Miranda's creation has just celebrated 1 year at the King's Cross Theatre, and while the show may have experienced some cast changes since it first opened in October last year, the show is still as fresh, vibrant and full of talent as ever. Set in Manhattan's Washington Heights during a summer heatwave, In The Heights follows the lives of the inhabitants as they struggle with their own individual plights, as well as the larger issue of gentrification in the area. While there is an overarching storyline, the plot is a combination of several different characters' stories, and as such the audience is inevitably able to identify with at least one of the characters' predicaments. Several of the original cast members remain with the show, the most notable of which being Sam Mackay who plays the lead role of Usnavi. Mackay has received rave reviews for this role, and it's easy to see why. He exudes a likable dorkiness which really endears him to the audience. Add to this his mastery of rap and easy charisma and he is the perfect man to lead the cast of In The Heights. Despite Usnavi being the central character, the plot really revolves around the community of the Barrio, with Usnavi himself pointing out that his role is to 'illuminate the stories of the people in the street'. In fact, the show is very much an ensemble piece, with a cast which is faultless without exception. Some notable new additions to the cast include, Sarah Naudi as Vanessa, Juliet Gough as Camilla, and Arun Blair-Mangat as Benny. Blair-Mangat brings a likable swagger to the role and has beautiful chemistry with Gabriela Garcia's Nina. Central to this production of In The Heights is Drew McOnie's award winning choreography, which perfectly compliments the pulse pounding Latin and hip hop inspired score. Almost every song is accompanied by heart stopping choreography, but it never distracts from what is being sung, nor does it look overcrowded or cramped on the King's Cross Theatre's traverse stage. Instead it draws attention to the theme of community which is central to the story. However, no doubt for many audience members the biggest draw of In The Heights is the music. 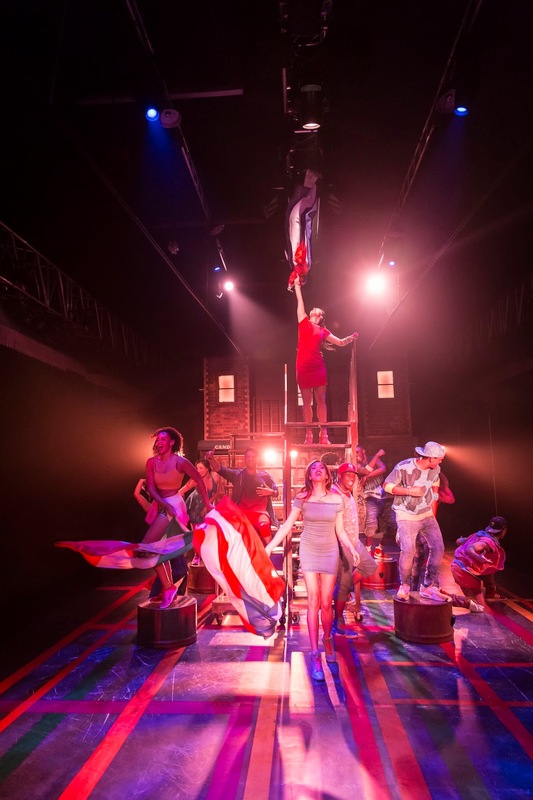 With music and lyrics by man of the moment Lin-Manuel Miranda, those biding their time until Hamilton arrives in London next year will no doubt enjoy the clever, witty and sometimes gut wrenchingly ratable lyrics of In The Heights. From the opening number onwards, every song grabs the audience and forces them to sit up and listen. There is a delightful urgency to many numbers which echoes the bustling and relentless community within the Barrio, and nowhere is this more relevant that in 'Blackout', the act 1 finale. It's a showstopping number all round, with ingenious lighting design and sizzling vocals, all of which emphasise the amazingly affecting melodies and motifs of Miranda's music. Contrastingly, more simplistic solos such as Nina's first song 'Breath' still elicit an incredible reaction, thanks in no small part to actress Gabriela Garcia whose spine tingling vocals capture the essence of the song perfectly. Unfortunately, occasionally this level of emotion is not reflected in the book, which does seem overstuffed and over-sentimental at times. However, this is a minuscule nitpick in such a multifaceted show! All in all In The Heights is still one of the most exciting and unmissable musicals in London. Be sure to catch it before it closes on January 8th 2017. In The Heights has extended its London run at the King’s Cross Theatre for the third and final time and is now booking until Sunday 8 January 2017. Tickets start at £22.50, with a selection of best seats available for Under 25s at a special rate of £15 at every performance. Visit www.intheheightslondon.com for more information and to purchase tickets.